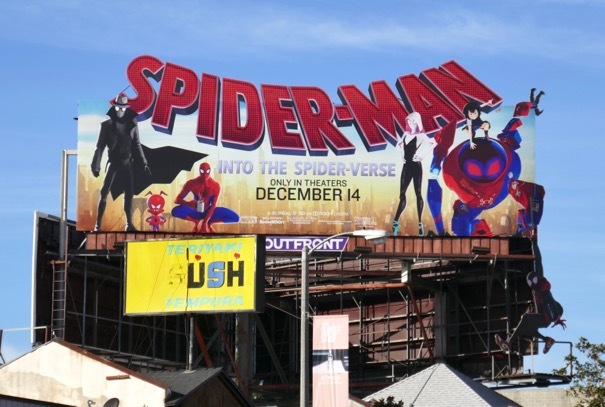 When Spider-Man was introduced way back in 1962, who'd have thought all these years later there'd be a whole host of spider-men, women, animals and robots inhabiting the Marvel Multiverse. 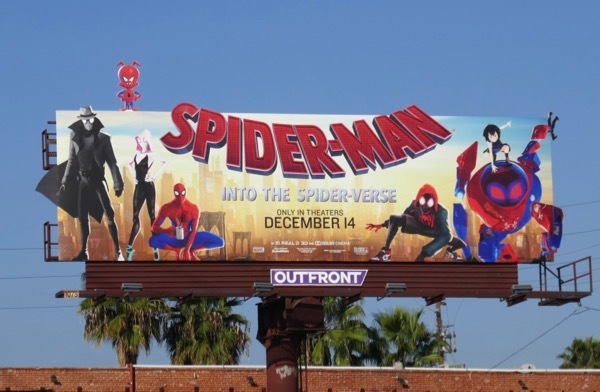 This December your friendly neighbourhood Spider-Man takes a computer-animated trip Into the Spider-Verse to meet up with some of his arachnid alter-egos from different universes. 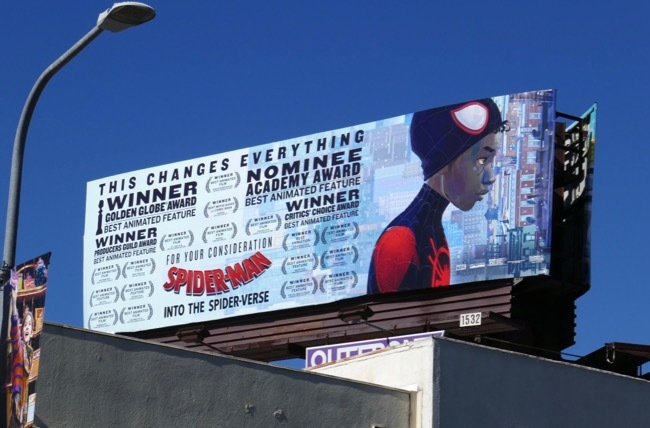 This cinematic installment shines a spotlight on Brian Michael Bendis and Sara Pichelli's Ultimate Spider-Man introduced in 2011, a young Afro-Latino teenager named 'Miles Morales'. 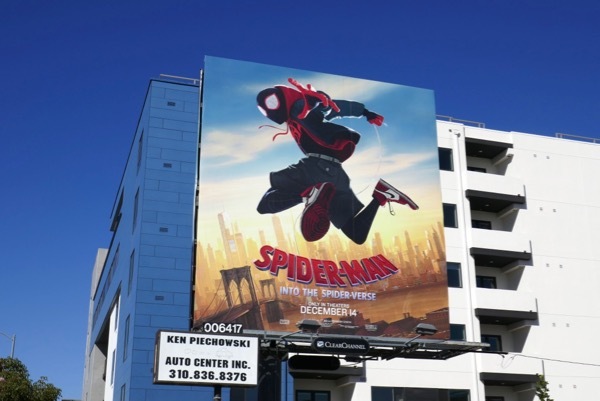 The Get Down's Shameik Moore voices the 13-year-old Brooklyn teenager with spider-like superhuman abilities as he juggles his family, high school and learning to be a superhero. 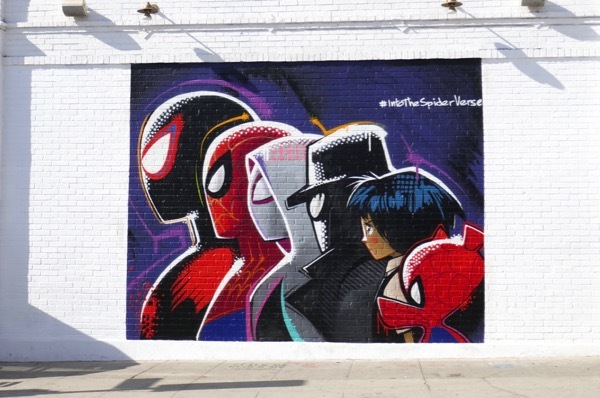 To help him save all reality he teams-up in classic Marvel style with Spider-folk from parallel dimensions, including the original 'Spidey (Peter Parker)', Spider-Man Noir, 'Spider-Gwen', 'Peni Parker' and her robotic 'SP//dr Suit' and even the porcine 'Spider-Ham'. 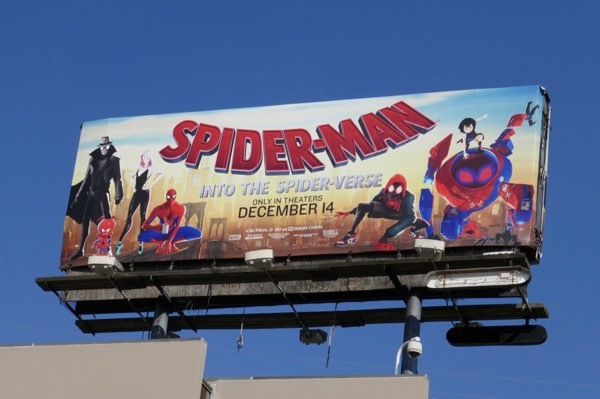 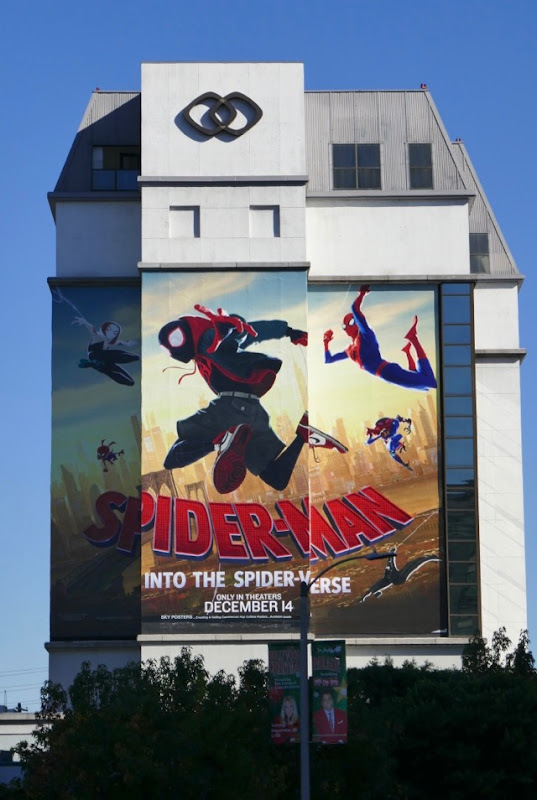 These animated movie billboards were photographed along the Sunset Strip, Melrose Avenue, Beverly Boulevard, La Brea Avenue, Santa Monica Boulevard, La Cienega Boulevard and Overland Avenue from November 11 to November 23, 2018. 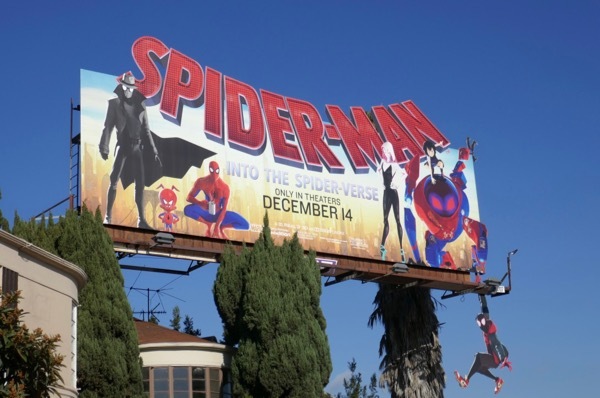 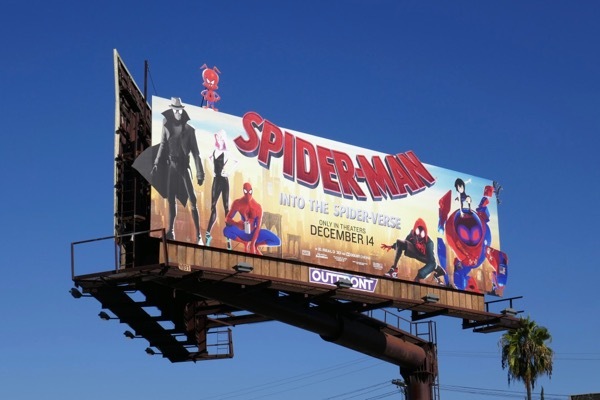 Marvel Comics fans are sure to love all these giant-sized and special extension billboards and hand-painted murals filling the city streets and skyline, but casual cinema goers may be a bit confused by this gallery of Spider-People. 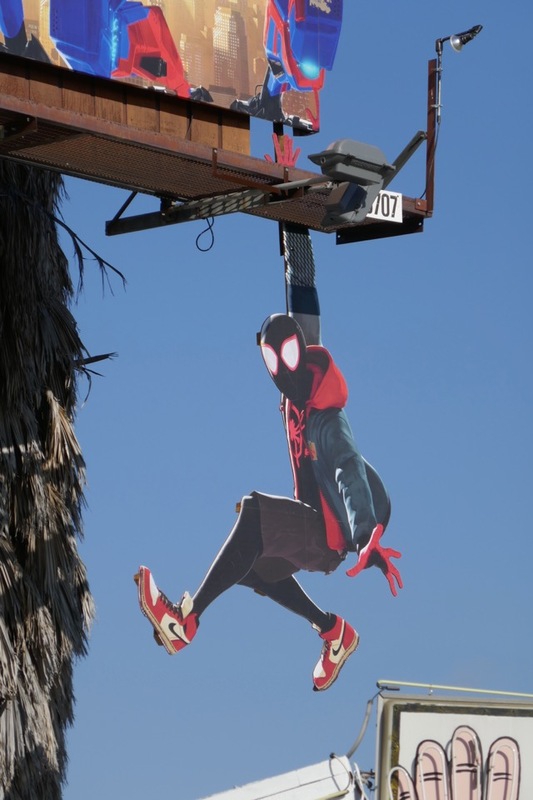 Fortunately the familiar red-and-blue-clad 'Peter Parker' wall-crawler is present to entice those who may not be so up-to-speed with the new generation of web-heads. 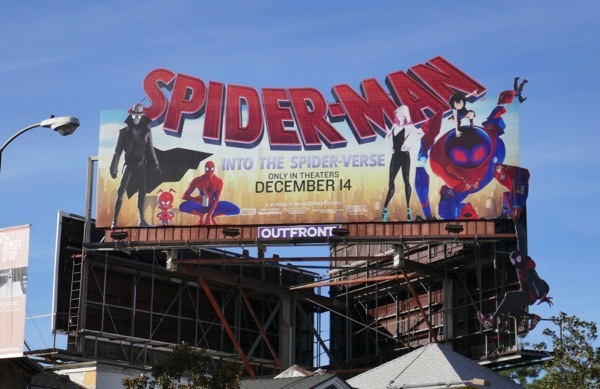 Spidey aficionados can also check out these Spider-man: Homecoming movie billboards, these billboards for The Amazing Spider-man 2 and these Avengers: Infinity War movie billboards. 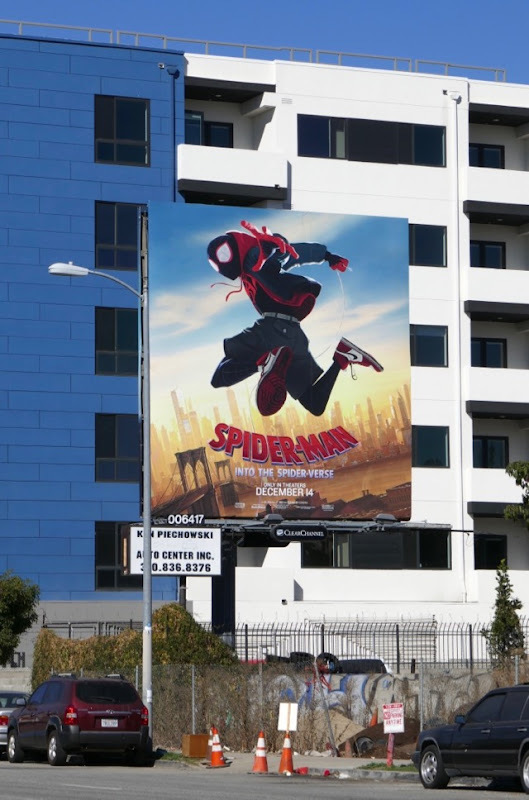 Plus for another great example of a billboard with something dangling from it, be sure to also take a look at this cool billboard for Jackass presents Bad Grandpa. 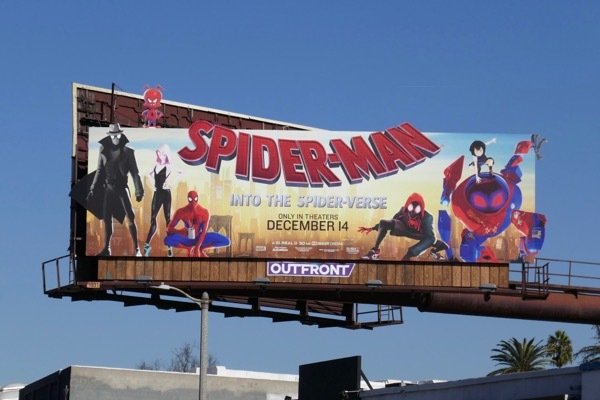 Hold onto your masks and tights web-slingers, this looks like it may be a fun, wild ride into the Spider-verse. 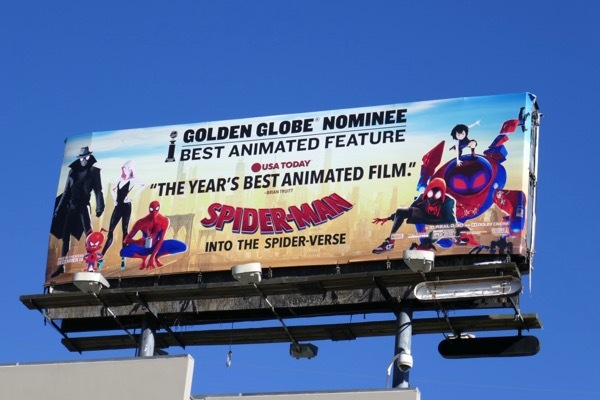 UPDATED: Congratulations to Spider-Man: Into the Spider-Verse for its Golden Globe nomination for Best Animated Feature. 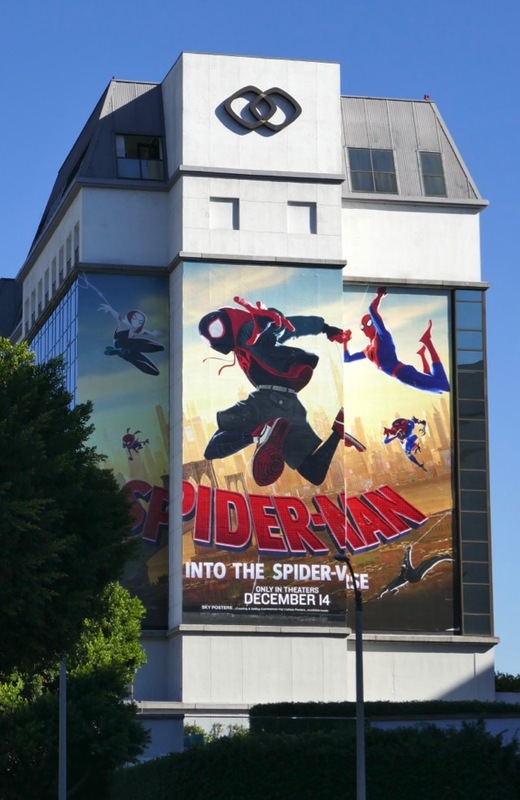 Here's a billboard capitalising on that accolade above the Sunset Strip on December 13, 2018. 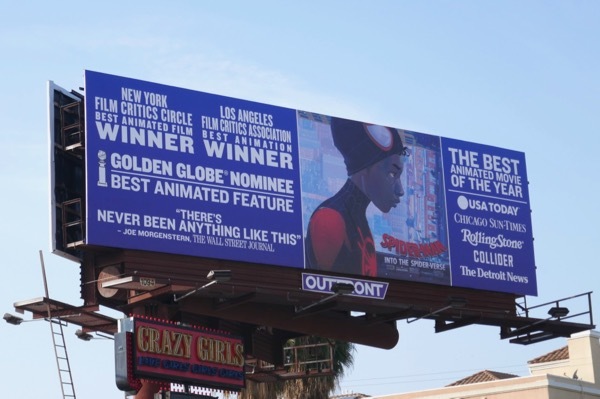 Plus here's another Golden Globe nominee billboard hoping to attract Oscar voters attention this awards season, spied along La Brea Avenue on December 24, 2018. 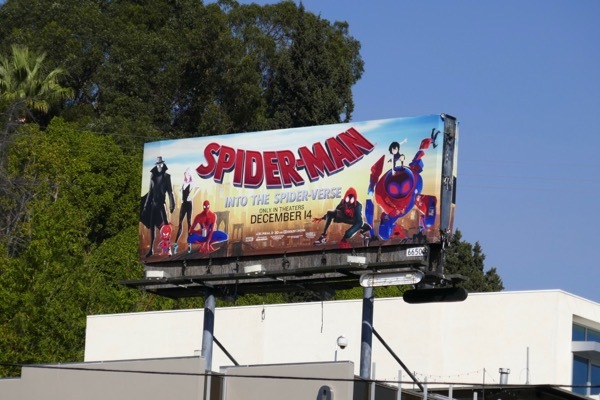 And here's another FYC billboard example spotted along La Brea Avenue on December 26, 2018. 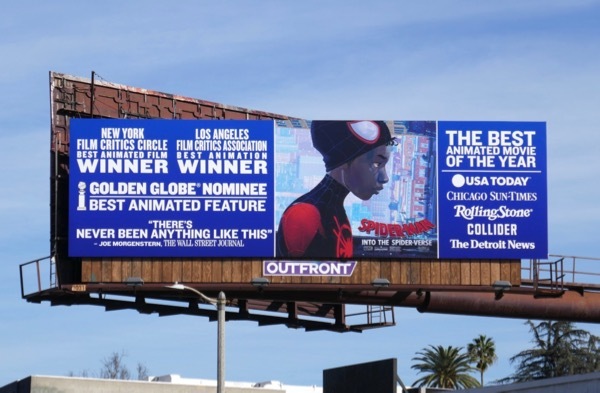 UPDATED: Congratulations to Spider-Man: Into the Spider-Verse for winning not only the Golden Globe for Best Animated Feature, but seven wins at the Annie Awards and an Oscar nomination. 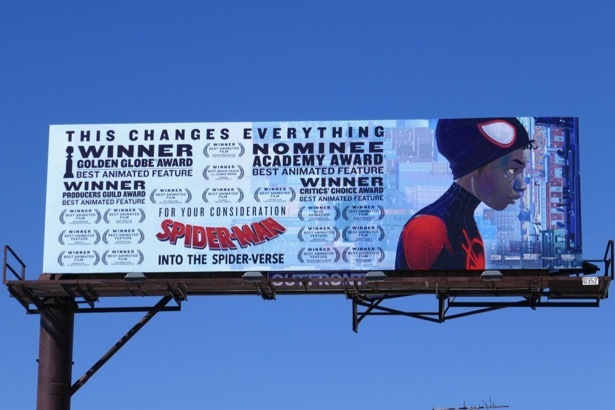 This Academy Award nominee billboard was spied high over La Cienega Boulevard on February 6, 2019. 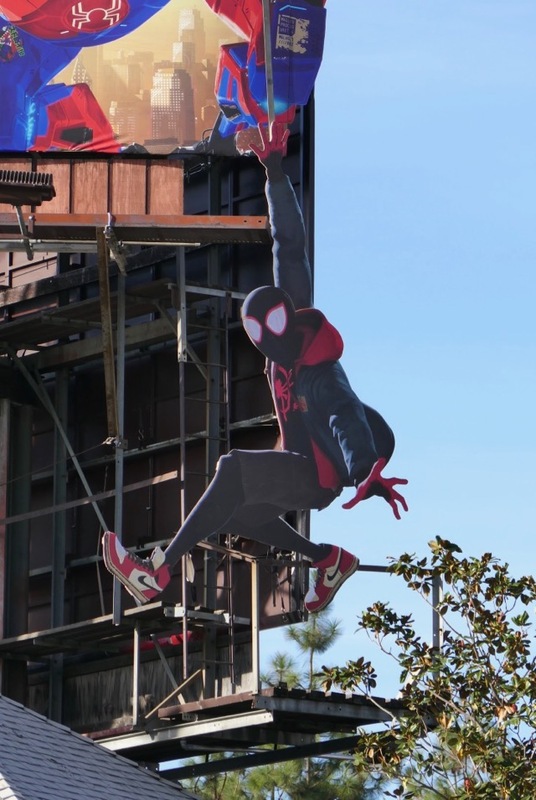 And here's another example spotted above Westwood Boulevard on February 23, 2019.